Each of our charts can be made for anywhere in the world, based on the maritime chart. I first met Tony Flemming at the Southampton Boat Show where he was exhibiting his Flemming 65 Motor yacht. He is a renowned designer/entrepreneur. Tony saw my table designs and commissioned me to make a 3D table chart for his boat Venture 11. I worked with him on the design of the table so that it would integrate seamlessly into the boat interior. The requirements were that the table would resemble his current design, which had a curved elliptical shape. 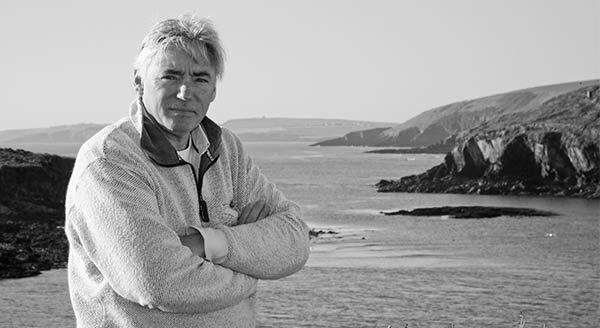 Tony has strong ties to Jura in Scotland, which was the focal point and we would include as much of the west coast as possible. The 3D chart itself was a B&W chart which I sourced from the UKHO Archive. The next challenge was to establish content and determine the overall size. Working closely with Tony, I scoped out the content and set about creating the 3D chart. The overall piece was large and complicated, the west coast of Scotland is rugged with many islands and deep channels. The main features included Mull, Isla, Jura, Aran and the Kintyre Peninsula. The first step is to scale and print the charts. Several charts are required in the making of each individual 3D chart. The paper charts are then cut by hand, for example on the first chart we will cut out the land, the second will be the 6 fathom depth, so on and so forth. On a chart this complex you could have as many as 800 individual pieces. Each and every piece is then mounted onto a special substrate. Everything is cut again……….yes, another 800 cuts! So now we have to assemble the pieces, it is best described as a Jig Saw but in 3D. This a long and painstaking exercise, many of the pieces that make up offshore rocks are tiny. So a simple rock that is say 4 layers high will take 8 cuts to make and then there’s the assembly. A big challenge with Tony’s table was the overall elliptical shape, it is large and very difficult to handle. I opted to let key features like Aran island drift out over the edge, it was a balancing act of trying to keep as many features in the space available and be able to fit it into the table. The table was fitted with surround LED lighting. Again there are a number of factors at play, the lighting must be hidden, it must cast light across the face of the chart, it must emit low heat and above all be reliable. 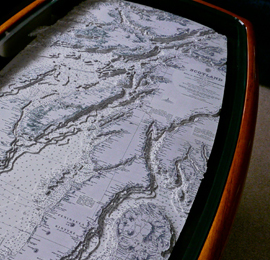 “After meeting Bobby on his stand at the Southampton show and seeing his intriguing and meticulously executed 3D charts, I decided to order a chart of the Hebridean Islands to incorporate into a custom coffee table for my personal boat. Bobby selected the perfect chart for the job and did a wonderful job. The table now occupies pride of place in the saloon and is much admired by everyone who sees it.” My great, grandfather was born on the Isle of Jura, so the island – and the table – are of great sentimental value to me.